If you want to take your DIY game to the next level, you need an impact wrench. Although some impact wrenches also require an air canister, the best impact wrench for the home DIYer is often a compact, cordless model. We’ve rounded up our top picks for the best impact wrench in 2018. Check them out. What should you pay attention to when choosing the best impact wrench? A few things, especially if you’re looking for a cordless model. One thing to look out for is the battery. These days, you don’t want anything less than a lithium-ion battery. 4ah is excellent, 3ah will do in a pinch (one of our picks, the VonHaus, comes with a 3ah battery). Another thing to pay attention to is torque. We won’t bore you with a physics lesson, but you want an impact wrench that’s going to be able to loosen machine or factory tightened nuts. Most of the models we looked at have a max torque of 300 ft-lb. The most powerful model, the DeWalt DCF899HB, has a max torque of 700 ft-lb. Other features, such as an LED light and a comfort grip are just bells and whistles. The DeWalt DCF899HB impact wrench is the granddaddy of impact wrenches. It’s a beast. Yes, we’re mixing metaphors because this is seriously the best impact wrench that’s battery-powered that money can buy. And when we say money, we mean money, as the model is a little bit more expensive compared to other cordless options. But it also has significantly more power, with 700 ft-lb maximum torque and breakaway torque of 1,200 ft-lb. There are even some air powered impact wrenches that can’t match it. 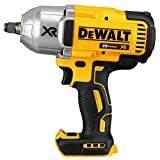 People who have used the DeWalt impact wrench have praised its power, with one person noting that they were able to change a tire in just a few minutes. Other benefits of the impact wrench include a light, so you can easily see your work area and three speed settings. Of course, the drawback of the impact wrench is that you do need to charge up and replace the batteries from time to time. A few people noted that their wrench seemed to die quickly, but whether that’s a battery issue or a longevity issue isn’t clear. 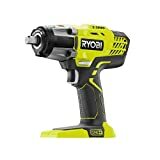 The Ryobi impact wrench is considerably less powerful than the DeWalt but is still a good option for the DIYer who’s looking to change their own tires or work on their own construction projects. It has a max torque of 300 ft-lb and a three-speed selector that gives you the option of going from zero to 3,200 impacts per minute. The impact wrench seems designed for use in less than ideal conditions. It’s got a rubber grip which makes it comfortable and easy to hold onto. It also has an LED light, so you can keep working even in the dark. The impact wrench is designed to work with Ryobi’s 18V battery, which is sold separately. People who’ve used the wrench have generally been happy with its performance, with a few noting that it’s a good pick for DIY folks. The primary complaint people had about the impact wrench was that it seems to die quickly and that it quickly stops working at the most powerful speed. Others have noted that you do need a good battery to get the most from the impact wrench. One person stressed that nothing less than a 4ah battery would do. Has a comfort grip and a light. You need to make sure you get the right battery or power will be wimpy. Like the Ryobi cordless impact wrench, the VonHaus cordless impact wrench has a max torque of 300 ft-lb. It has a tightening torque of 260 ft-lbs. Compared to other cordless models, the VonHaus has a pretty powerful motor, with a 20 v battery. It’s also one of the only cordless impact wrenches to come with a battery and charger. Let’s talk about that battery for a minute. It has a rapid charge feature, so your impact wrench will be ready to go in just over an hour. The battery also works with other VonHaus tools. People who have used the VonHaus impact wrench are pretty impressed with it. Although 300 ft-lb might not sound like much (especially when some models promise 700 ft-lb), some users were quick to note that most lug nuts are only torqued to 100 ft-lb, so 300 ft-lb is plenty. The one complaint people had about the impact wrench is that it is deafening. If you’re going to use this one (or any impact wrench, for that matter), we recommend wearing appropriate ear protection. Has a variable speed trigger. The Craftsman impact wrench promises to free you from the need to use an electric or air powered impact wrench without sacrificing power. Does it live up to its promises? It depends on who you ask. On paper, the impact wrench looks pretty powerful. It’s a zero to 3,000 RPM motor and can provide up to 300 ft-lb of torque. Unlike other cordless impact wrenches, the Craftsman model comes with a battery. In this case, it’s a 4ah lithium-ion battery, which gives the wrench a power boost of 20 percent. Another feature of the battery is that it works in pretty much all weather. We hope you wouldn’t have to use your impact wrench in 5 degrees or 158-degree conditions, but if you did, the battery would come through for you. The impact wrench also has a comfort grip handle and a light to help you see even in less than ideal conditions. For the most part, people who’ve used the Craftsman impact wrench have loved it. A few did complain about its weight (it’s on the heavy side). Those who weren’t happy with it noted that it seemed to lose power quickly and that the wrench struggled once it reached 100 ft-lb of torque or so. Another complaint about the wrench focused on its noise. This impact wrench is a loud one, so make sure you have ear protection. 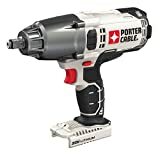 The Porter-Cable impact wrench provides a smidgeon more power than the majority of the wrenches in our roundup — 330 ft-lb. Interestingly enough, it has a lower max RPM — just 1,650. Comfort-wise, the Porter-Cable has the needs of the user in mind. It’s got a comfort grip handle and features an LED light, so you can see easily when working in dark corners. Unfortunately, the impact wrench doesn’t come with a battery or charger, so you need to find and buy those on your own. For some people, the fact that the impact wrench doesn’t include a battery can be a blessing. One user noted that the wrench works even if you use “off-brand” batteries. Others noted that you need to make sure you get a 4ah battery or else you’ll be sorely disappointed in the impact wrench’s performance. Overall, people have been happy with their Porter-Cable impact wrenches. A few have said that they’ve switched from DeWalt to this brand because they find the quality better. Max torque of 330 ft-lb. Need to choose a higher-powered battery to get the most from the impact wrench. When you’re choosing an impact wrench, you can choose between several different power sources. Traditional impact wrenches are air-powered. Other options included electric powered impact wrenches and cordless, battery-powered impact wrenches. While our roundup only includes the best cordless impact wrenches, we thought it’d be useful to understand how each type worked. Air impact wrenches, aka pneumatic impact wrenches, use air pressure to power their motors. You need to hook the wrench up to a canister of compressed air. 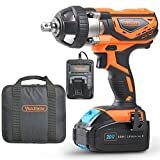 Electric impact wrenches plug into an outlet. That can be both a positive feature and a drawback. It’s a positive feature because you don’t have to buy compressed air. It’s a drawback because you always need to be near a source of electrical power to use one. Cordless impact wrenches are usually battery powered. You can use them pretty much anywhere, as long as you remember to charge up the battery first. The big drawback of cordless impact wrenches is that they won’t be nearly as powerful as their air-powered cousins. They’re usually powerful enough for “at home” projects, though. If we’re going to be honest, we’ll have to admit that not everyone is going to need an impact wrench, whether the wrench is air-powered, electrical or battery-powered. But there are cases when an impact wrench is the only tool you can use to get the job done. One case is when you need to remove nuts and bolts that have been factory tightened. Good luck getting those off with a manual wrench. Another instance when using the best impact wrench is the best option is when you need to make sure a nut or bolt is secure. You don’t want your tires falling off when you’re traveling down the road at 55 mph, do you? Of course, you don’t have to have a practical reason to switch to an impact wrench from a manual wrench. Sometimes, it’s just more fun to use a high-powered tool to get the job done. We’d say that using a cordless impact wrench is easy, but there is a bit of finesse required. You don’t want to overtighten the nut, or you risk stripping the threads or stretching it out. To use the impact wrench, attach the appropriate size socket based on the size of the nuts you’re tightening or removing. Adjust the direction the socket will spin. If you’re tightening, it should go forward. If you’re loosening, it should go in reverse. Some impact wrenches also give you the option of adjusting the speed based on your project. Tighten nuts by placing the socket over the nut and by gently pressing the trigger. Don’t use too much pressure on the trigger, as you don’t want to overtighten. Move on to the next nut once the first one is in place but not fully tightened. Repeat with the remaining nuts. Once all the nuts are in place, you can go back and tighten them. Place the socket over a nut and pull the trigger in fully to hammer the nut into place. Repeat with the remaining nuts. If you need to loosen the nut, you can do so by switching the direction to reverse. Pull on the trigger so that the nut and socket spin free. Once the nut is loose, release the trigger. You should be able to pull the nut the rest of the way free. Our top pick for the best impact wrench is the DEWALT DCF899HB 20V MAX XR Brushless High Torque 1/2″ Impact Wrench with Hog Ring Anvil. This bad boy has the most power and the best speed of any of the wrenches we looked at.